French entrées are served at the start of the meal. If you have ever dined in a French restaurant, you are familiar with the French love for courses. In a more formal meal, you will sometimes find as many as eight courses, perhaps more. You need to be in good physical condition just to last through one of these elaborate meals. I have sometimes felt like collapsing on the table from the sheer exhaustion of all that eating. 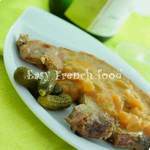 Perhaps you came to this page looking for French main course recipes. In France, l'entrée is just that, the beginning of the meal. However, in years of yore, the entree was a part of the meal that was announced with considerable fanfare. The dish literally made its entrance (son entrée) perhaps with horns blowing and banners waving. In English speaking countries, the entree sticks more to the original intention of the word. Typical meals at home are, of course, much simpler affairs. However, even in these informal circumstances, a French entree is often served as a prelude to the main course. Our kids eat at the school cafeteria, and it is surprising to see how structured the meal can be: entree, main course, cheese, dessert. No wonder they have 90 minutes for lunch - they need it just to eat! I love serving a first course, even if it is often just a tossed salad at our house. It gives me the chance to balance the meal -which for us usually means: more vegetables! 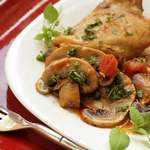 A French entree does not necessarily have to be light - it can also be something a bit heartier if, for example, you are serving poached fish as the main course. Consider the effort involved to prepare each course. If all you have to do for the main course is bake a chicken and some potatoes, you can take a bit more time to prepare an entree, and vice versa. 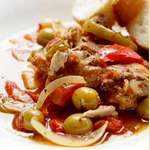 Entrees are a chance for people to relax a bit, slow down, so that the main course isn't eaten in a big hungry hurry. 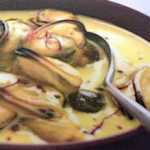 Some dishes, including many French soups, while usually served as a French entree, can also serve as main courses. It really is for you to decide and have fun with. You can serve the first course on a separate, smaller plate. This puts the emphasis on each course as a distinct thing to be appreciated on its own. The time it takes to collect up these plates and serve the main course gives a small space in the middle of the meal - good for conversation and digestion. The few extra dishes this creates is well worth it. Such a simple and yet so tasty entree or appetizer. Creamy Brie cheese is baked between layers of puff pastry. Add in some fig jam and toasted almonds and the result it divine. Souffles make spectacular entrees, but you have to have good timing. You could also serve this as a light meal with a large green salad. Be sure to allow plenty of time to cook the onions for this yummy warm entree. You can also serve this an appetizer. Flamiche is a delicious leek tart that comes from the Picardy region of France. Learn how to make it easily and about other famous foods from Picardy. Yikes! I couldn't think where else to classify the Croque Monsieur so he ended up here. A French classic. This very simple tart is filled with leeks, tapenade and goat cheese. Yummy! A yummy onion anchovy pizza from the south of France that can be served as an appetizer, entrée or main course. Poached eggs can make a very satisfying entree, especially when topped with a fancy French sauce. A fabulous way to take advantage of fresh figs when they come your way. Here is a quick way to fix this yummy Alsatian tart, rich with cream and bacon. Great for lunches. A cold, layered dish made with zucchini, spinach and eggs. Very pretty.